Ryan Merchant and Sebu Simonian, the front men behind the breakout alt-dance group Capital Cities, are a success story spawned by the loyal fans that has continued to blossom. The Los Angeles-based act took both the blogosphere and the shores of California by storm with their self-titled debut EP, out now on Capitol Records/Lazy Hooks. Their electronic-infused pop rock represents all that is right in modern music making, and makes the perfect soundscape for a day at the beach, or a night in the dark part of town, as long as you're ready to dance. Good feelings are palpable between Merchant and Simonian, two singers, songwriters, and multi-instrumentalists who've both made music since they were kids. Simonian was born in Syria to Armenian parents, but raised in Lebanon until the age of six when his family moved to California to escape civil war. In Los Angeles, he studied piano and voice and sang in choirs throughout his schooling, and earned a bachelor's degree in music. Influenced by a mixed bag of psychedelic rock and electronic music from every decade since the 60's, Simonian started his first band at 15 and "I haven't looked back since," he says. The attention led to new fans, while their ability to build a grassroots following led to major label interest. 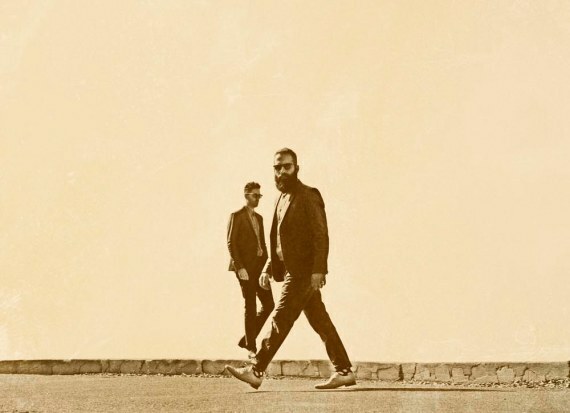 In December 2012, Capital Cities signed to Capitol Records, which licensed and re-released their EP and will release their debut full-length album this summer. "We've been DIY for such a long time that it's exciting to have this team of people behind us," says Merchant. Adds Simonian: "We are happy to be able to focus more now on getting creative, finishing the album, making videos, and rehearsing." The band will hit the road and visit over 30 U.S. cities in their "Dancing with Strangers" Spring tour.